I receive numerous requests to review new albums and I always listen to samples of the music before I agree to do it. I can normally tell within a few minutes whether or not I feel I have something to say about somebody’s work – it’s never a case of if I think it is good or not, but always whether it provokes an opinion. 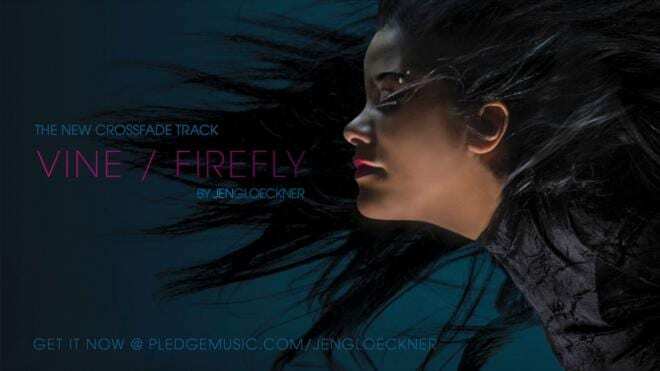 What is fascinating about Jen Gloeckner’s new album “Vine”, is that from minute one, track one, I could not stop listening and before I knew it, I had played the album all the way through on the first listen – proof enough for me that this album is worth your time. I guess the reason I never reached for the stop button is because the album flows. This is helped by some stunning sound design and production in which a shimmer reverb/delay is used pretty much throughout. I love this effect as it swirls from ear to ear and creates beautifully rich sonic sounds. It reduces (or elevates) guitar and keyboard sounds to swooping and whooshing sound frequencies that encircle the listener and carry you off into a dreamlike state. On tracks like “Prayers” a strong rhythm holds the central position while movement from everything else is totally fixating. On other songs like “Colors”, “Blowing Through” and “Counting Sheep”, which are slower, Jen’s deep and sultry voice becomes the focal point. “Vine” is definitely best listened to in full and with headphones, as from the opening title track the stage is set and with almost cinematic grandeur the journey continues as it fades into the instrumental “Firefly (War Dance), which has shades of Bjork’s “Army of Me’ running through its veins. The main story is beautifully captured in the next run of songs including the sumptuous “Breathe” with its Fripp-esque guitar parts. “Ginger Ale” and The Last Thought” contains vocal arrangements and harmonies that Enya would have been proud to record. The album’s pinnacle is reached with “Blowing Through” and “Counting Sheep” where Jen’s voice sits beautifully in a mix that has an orchestral vibe seen in songs by crooners from the 1950’s – think Tony Bennett’s “The Good Life” or “Old Cape Cod” by Patti Page or Peggy Lee’s “The Folks Who Live on the Hill” – it is both brand new and retro. A treat for ears long tortured by the bland music by numbers pop so prevalent these days. The wind instruments on “Blowing Through” are particularly breathtaking. “Prayers” is next and although running at a higher tempo than much of the album, still manages to resist being a stomping four on the floor festival track. There are moments when the bass drum kicks in, but it is very restrained, allowing the swirling reverbs and delays plenty of room to captivate. The album winds down again from here with the final three tracks “Colours” (sorry “Colors”) where Jen’s voice peaks; “Row With the Flow”, which contains the hypnotic repeating phrase ‘I know it’s not that easy” (listen out for the backing vocal that is low and terrifying); and finally “Sold” with its gently picked electric guitar and whispered vocals. The vocal arrangements on this and the other tracks are masterfully worked out and produced, providing a soundstage that is wide and deep. Not too shabby for an album recorded in Jen’s bedroom (although it has been mixed and mastered by engineers who are world renowned). Jen’s attention to detail as a producer is stunning as she manages to utilise multiple synth and guitar lines, on top of multi-tracked vocals, trip-hop drumbeats, massive spatial reverbs and delays, and keeps everything clear and distinct – other producers end up with a sonic mess, but this is a masterclass in the art of production and engineering. On repeated listens you hear more and more, and it almost demands you hit repeat again and again so as not to miss anything – not something you get with many other artists. What is most interesting about this album is the difference between this and Jen’s debut album “Miles Away” from 2005, and her last album “Mouth of Mars” in 2010, which sees her moving from a more traditional guitar, bass, drums sound to “Vine” that has both feet firmly planted in electronica. How many of her original fanbase will join her on this journey remains to be seen, as I would imagine someone who loves the alt-country/rock sound of her early career would not necessarily fall in love with “Vine”. Personally I love it when an artist moves genres and I think this is Jen’s best work to date. ‘VINE’ was released on April 14 and can be purchased from her website. It is well worth your time and attention.